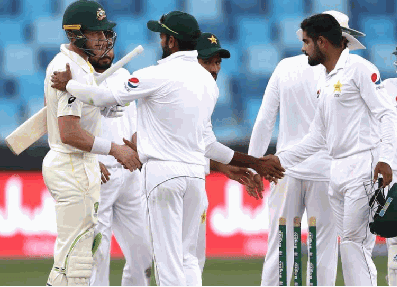 Pakistan fixed their grasp on the second Test against Australia in Abu Dhabi Thursday as they achieved 232-4 at lunch, in a morning set apart by an odd come up short on Azhar Ali. At the break on the third day, Asad Shafiq was unbeaten on 42 and with him, Babar Azam on 34 not out as Pakistan's general lead achieved 369 with six wickets unblemished. The main Test in Dubai a week ago finished in a draw. The play was dull in the first place, however, was lit up by Azhar's humiliating rejection. The batsman edged a Peter Siddle conveyance to the third man limit and thinking the ball had crossed the rope, ended amidst the pitch to converse with individual batsman Safiq. Be that as it may, Mitchell Starc picked the ball a yard from the limit and tossed it back to wicketkeeper Tim Paine, who ran Azhar out, leaving the Pakistani couple — who have a consolidated affair of 130 Tests and more than 9,000 runs — looking staggered and timid. Azhar fell for a very much played 64, comprehensive of four limits. Pakistan had before lost Haris Sohail for 17, puzzled by Paine off Nathan Lyon in the wake of continuing at 144-2.